Came home earlier than I normally do from London so ended up being able change into something way more comfy and snap a few snaps before hitting the hay. Will talk more about goings on (and the lolz) from yesterday and something happening next week tomorrow (twitter type comp thing-a-ma-jiggy), when I can string a more coherent sentence together, my bed and a cup of extra strong tea are calling me. Oh and a few episodes of Jersey Shore. Living the dream! I love that skirt so much, I've been searching for it in H&M for ages! Have you seen the new series in italy? The Situation makes me feel embarrased to be human. need to head out to new look and get this! aha! I need a jumper like this! your jumper is really cool! I love your rings and your necklace! LOVE the jumper - I'm so obsessed with jumpers, I think my collection is just going to grow and grow this winter! Love your rings and your nails! Cant believe I haven't seen any of the new season of the shore yet.. neeeeed to do that. Love the jumper, great outfit as always! How is your flat hunt going? And which part are you looking? 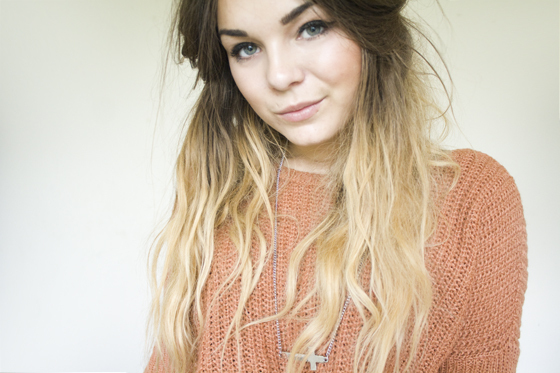 I love this jumper, I recently bought a top in this colour, I love it! Love the jumper! Looks so cosy. Can't wait to go into town tomorrow to buy a couple in prep for winter, haha. I ove you jumper looks really comfortable ! 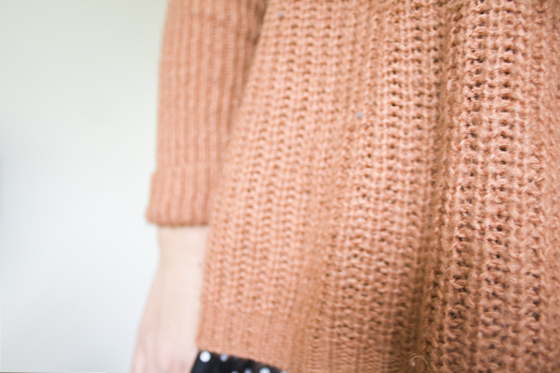 The sweater is darling and such a lovely tribute to autumn. Love that skirt so much! Def gonna head to H&M tomorrow! Love that jumper, gorgeous colour. That looks like such a comfy sweater/ Love it even more with the skirt. I love your sweater! So cute and cozy looking! you have great color palettes! Love the polka dots underneath! I love your rings! saw some similar ones in an antique store, i was going to buy them until i saw how expensive they were!! I really want this jumper, did you buy it recently? I absolutely love your sweater! And how did you do this effect on your hair! It's gorgeous! I've just written a post about knitwear actually, check out my blog if you have the time I think we have quitew similar tastes! Love your jumper too ! There is a gaping whole in my wardrobe that only POLKA DOTS can fill! Stunning dress up look! It is a great brand. It is a just mind blowing piece of fashion..! Comfort inspires me! Your blog very best content about fashion....I love..! Love this outfit. That jumper is such a nice colour x.
I love this look Lilly! Love the jumper! really need to start stocking up on winter knits!